I’ve lost count of how many times I’ve ripped my pants. If there’s a way to get stuck on a fence by the rear of my pants, by golly, I seem to find a way to do it. I’ve ripped my pants running by fences, guard rails on the side of the road and during the transition from the swim to the bike portion of an indoor triathlon. When it comes to ripping one’s pants, I’m mighty gifted. And, as a result, I have a little experience with mending. 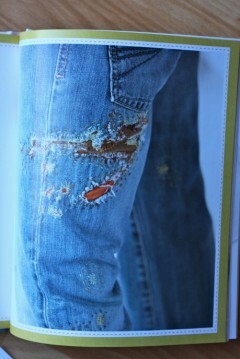 However, I didn’t always regard mending as fun. It was usually an annoying task that I would perform after an unfortunate and embarrassing incident. But, thanks to Kristin Roach, it doesn’t have to be that way for any of us who rip our pants (or anything else for that matter) from this day forth. Today I’m taking a moment to salute Kristin, also the creator of CraftLeftovers.com, for inspiring people to think about mending as a form of artistic expression. 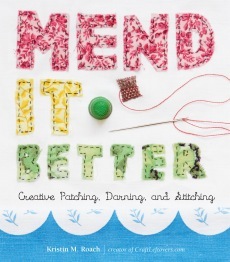 In her new book, “Mend It Better: Creative Patching, Darning and Stitching” ($18.95, 224 pages), Kristin and her contributors offer readers plenty of inspiration to repair garments as well as enhance them stylistically with a little creative stitching. She opens her book with a brief history of sewing and mending and schools readers about all the tools and supplies required for happy mending before offering detailed tutorials on how to repair holes, seams, hems, zippers and more. As a result of her detailed approach, Kristin has created a book that will serve as a great reference for crafters to keep on their shelves for the long haul. When I was kid and just beginning my journey as a habitual pants ripper, a patched pair of jeans was not considered a creative expression but more of an invitation for ridicule. But times have changed for the better, folks. (Thank heavens!) Creatively patched garments now fetch compliments, and books are being written to inspire people to mend with creative flair. What a great time to get stuck on the fence by the seat of one’s pants, eh? 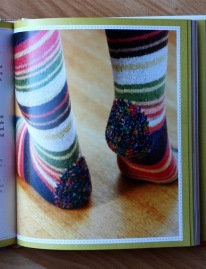 And even if you’re not in the habit of ripping your pants like me, I still recommend checking out “Mend It Better.” I mean, just look at this cool sock repair by book contributor, Cal Patch. And we all have socks with holes in them, right? Look for more mending inspiration in the form of a a Q&A Interview with Kristin and a darning tutorial in the Spring Issue of CraftSanity Magazine next week! I’d should check with you here. Which is not something I often do! I enjoy reading a put up that may make folks think. Additionally, thanks for allowing me to comment! F*ckin’ remarkable issues here. I am very satisfied to peer your article. Thank you so much and i’m having a look ahead to contact you. Will you kindly drop me a mail? Can I just say what a relief to locate an individual who basically knows what theyre talking about on the web. You definitely know tips on how to bring an issue to light and make it crucial. More people today must read this and comprehend this side of the story. I cant think youre not a lot more popular mainly because you absolutely have the gift.